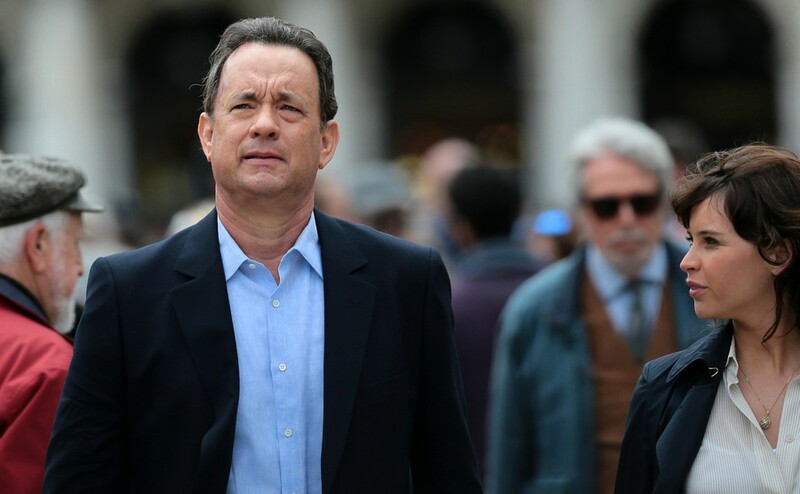 The film Inferno, starring Tom Hanks, had its world premiere in Florence this month. Most of the film was shot in the city, the birthplace of Dante. The movie Inferno brings to life the character of Robert Langdon from Dan Brown’s famous books and spotlights the beauty of Florence. Several of the Langdon series of books, which have sold more than 200 million worldwide and been translated into 52 languages, have been set in Italy, including The Da Vinci Code from 2006 which made $750million. Without giving too much away, the story begins with Robert Langdon waking up with amnesia in a hospital room in Florence. Without understanding why, he discovers he is the subject of a massive manhunt. He must use all his knowledge of symbolism to win his freedom, regain his memory and foil an intricate conspiracy. On the way he is helped by Dr Sienna Brooks, who is played by English Actress Felicity Jones. As the film follows Professor Robert Langdon on a trail of clues, he goes through some glamourous film locations including Venice, Istanbul and Budapest, but the star of the film is Florence. As director of the film Ron Howard says: “You cannot hope for a more beautiful city, it is full of open-air museums”. It was rumoured that the production made a donation to the Palazzo Vecchio, for the modernization of the building and Mayor Dario Nadella presented Howard with The Keys to the City, saying “I hope that it becomes an opportunity to showcase the best of our city”. Even since the release of the book in May 2013 there has been an increase in visitor numbers to locations in the books. 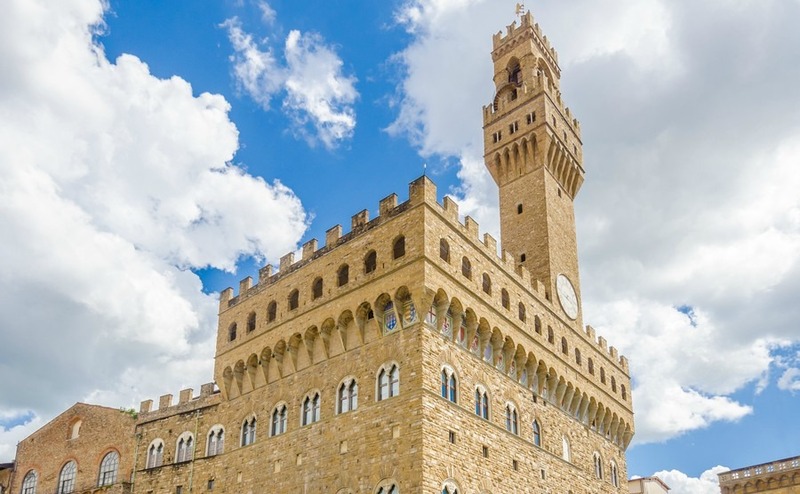 Palazzo Vecchio visitor numbers have doubled since the book’s release, as if Florence had any problem attracting tourists! In just the first half of 2016 there were 4.5 million overnight stays in the city. Tom Hanks during filming of Inferno. 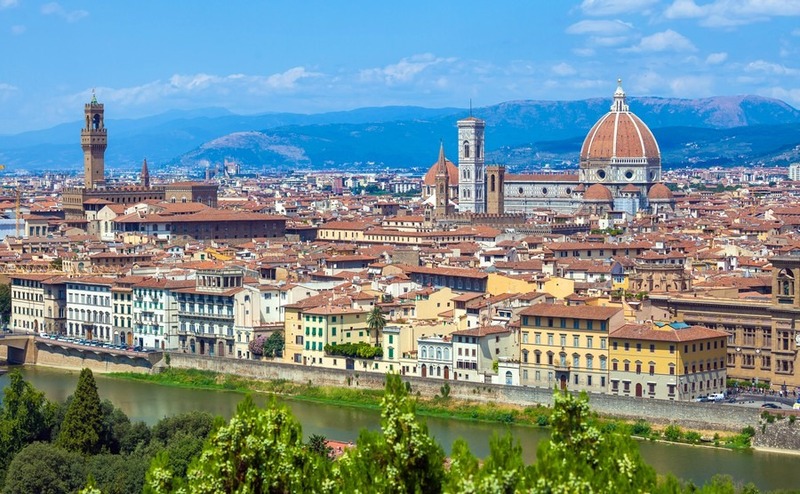 Many tourists have come to Florence looking for the places mentioned in the books. You can buy an Inferno guide book and take an Inferno tour. Langdon begins his journey at Torregalli Florence Hospital and ends up at Santa Maria Novella Train Station. When you visit Florence you might begin at the station but hopefully won’t need to visit the hospital. A trip to Florence requires plenty of time to take in the stunning architecture, art and views. Here are the Top Seven locations to look out for during your visit to Florence or when watching the film. In the opening action sequence of the film’s trailer you will see the bell tower of Badia Fiorentina. When looking across a roof top view of Florence look for a slim tower with a spire at the top. The Badia was the first monastery in Florence, founded in 978. The Abbey used to be the religious centre of Florence and the bell tower tolled the start and end of the working day. The Boboli Gardens extend over 111 acres behind the Pitti Palace, with views across Florence. In the film, Langdon and Sienna escape through these beautiful Italian gardens filmed by two drones. The gardens are well worth a visit, with sculptures dating from the 16th to 18th centuries, terraces, an amphitheatre, fountains, ponds, wooded paths and amazing caves. The weird and wonderful Grotta del Buontalenti is divided into 3 rooms, with stalactites and stone that looks like it’s melting from the walls, with statues and frescoes. It is well worth visiting the Pitti Palace and Boboli gardens during your trip. It’s well worth visiting the Pitti Palace and Boboli gardens. This enormous palace (Palazzo) is one of Florence’s largest architectural monuments. The original palazzo was built for the Pitti family in 1457. In 1549 it was bought by the Medici family and became the primary residence of the Grand Ducal family. In the early 18th century two further projecting wings, were added by the House of Lorraine. Today, the Pitti Palace houses some of the most important museums in Florence: The Palatine Gallery contains a collections of paintings from 16th and 17th century, the Royal Apartments display elegant furnishings, the Silver Museum (Museo degli Argenti) has a collection of Medici treasures; the Gallery of Modern Art holds a collection of mostly Tuscan 19th and 20th century paintings. In the separate Palazzina del Cavaliere, on the upper slopes of the Boboli Gardens, is the Porcelain Museum, while the Palazzina of the Meridiana contains a Costume Gallery, displaying fashions from the past 300 years. Robert Langdon discovers secret passageways that take him through the Vasari Corridor. This amazing passage was ordered to be built by Cosimo dei Medici, to connect the Palazzo Vecchio (the seat of government) with the family’s residence, the Palazzo Pitti. From the Uffizi Gallery the Medici could use the Vasari Corridor to cross the Ponte Vecchio bridge, and attend the Santa Felicita church, without mixing with the common people or being attacked. The Ponte Vecchio, or Old Bridge, was the only bridge across the river Arno until 1218. The current bridge was rebuilt after a flood in 1345. From the outside you can follow some of the Vassari Corridor’s route, by looking for the round windows as it passes over the shops on Ponte Vecchio and in front of the church. The Vasari Corridor is only open for private guided tours from the Uffizi Gallery. The majestic Salone dei Cinquecento, or Hall of the Five Hundred, was built from 1494. Its panelled ceilings, large wall frescoes, golden decorations and imposing sculptures are overwhelming to see. The two great Florentine artists, Leonardo da Vinci and Michelangelo Buonarroti, constructed the two large murals which decorate the walls of the room, with battle scenes depicting victories of the Republic (although they didn’t complete them). Professor Langdon and Sienna dash through Palazzo Vecchio in search of clues, they visit the hall, then the private studio of Francesco I and the Hall of Maps, which houses a six-foot-tall sphere, the largest rotating globe of its era, as well as maps painted on leather, showing the world as it was known in 1563. After leaving the Palazzo Vecchio through a side door onto Via della Ninna, our heroes dash into Piazza della Signoria and into the medieval streets of Florence. This is where Dante’s House is located. It is not the original home where he lived, but as the family was in this area, Florence celebrated the 600th anniversary of Dante’s birth by setting up the museum dedicated to the poet and medieval Florence. The Baptistery is located in front of the famous Florence Cathedral Il Duomo. After admiring the exterior of this octagonal 11th century building and the golden doors, make sure you have a ticket to enter inside to see the golden mosaic ceiling representing the various levels of Paradise and Hell, similar to the descriptions in Dante’s Divine Comedy. Dante and many other notable Renaissance figures were baptized in the font here. Other Italian film locations to look out for are in Venice. Some sequences were filmed at St Mark’s Basilica, on the Grand Canal, and in St Mark’s Square.